The WordPress admin area is your first port of call when it comes to managing your website. It’s where you’ll spend time managing updates, performing routine maintenance, publishing posts and more. This is why so many default settings and plugins that allow you to alter the way the admin area looks and functions exist. It’s only natural for some users to want to make the WordPress admin a little more comfortable by using it in their native languages. It should be noted we are not referring to making your site multilingual. You can check out our post How to Create a Multilingual WordPress Site for that topic. We’re going to go over the various methods you can implement to use the back-end dashboard of WordPress in nearly any language you please. Exclusive WPEngine Coupon Code for AlienWP Visitors! Get 5 Months Free & 30% Off All Plans. In this post we will cover how to install WordPress in a different language, how to change the language of WordPress once it’s been installed, WordPress language plugins and how to get involved with the WordPress project by helping out with translations. We’re going to be going over four different methods that allow you to change the language you use in the WordPress admin. 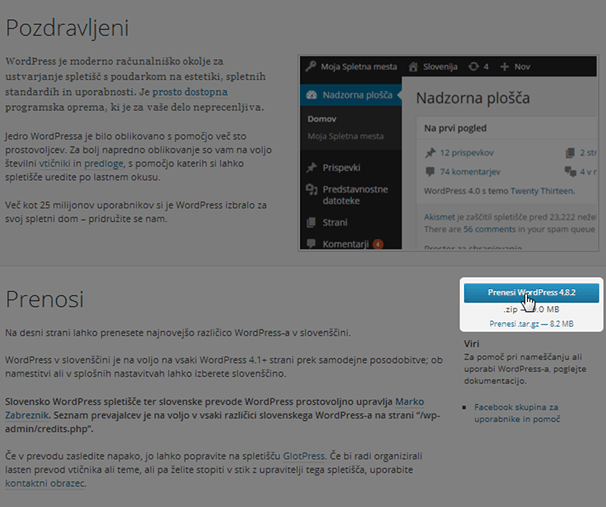 The first is when you install WordPress as one of the first steps is asks you to complete is selecting a language. 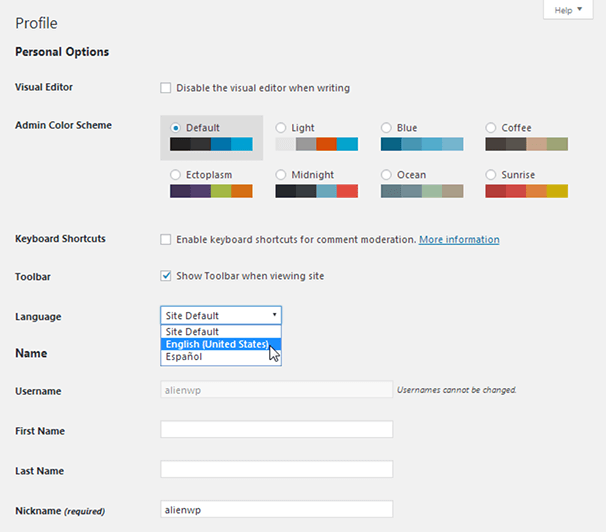 The second has to do with a setting added to WordPress core in WordPress 4.1, released in late 2014. It allows you to select and install language packs from the backend of WordPress. There aren’t many plugins that allow you to do this since this setting was released, but we’ll talk about a couple anyway after that. The final method we’ll go over is how to install language packs manually. This option won’t be available to you if your host installs WordPress on your server for you, meaning you didn’t download the latest version from WordPress.org and install it manually. All you need to do is choose from one of the dozens of languages WordPress comes pre-installed with, and click Continue. 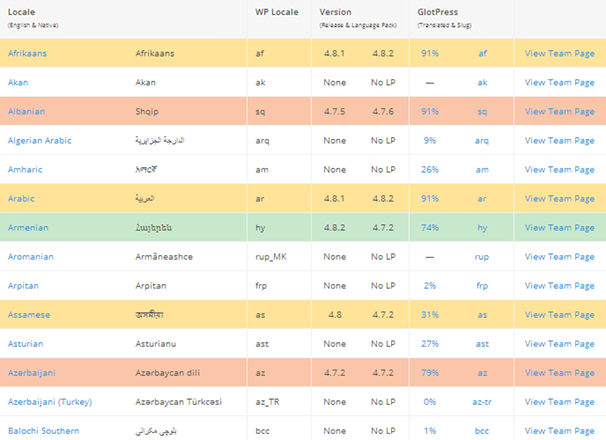 If you’ve already installed WordPress, you can still change the language it uses in the backend. Just go to Settings → General, and change the Site Language setting to the language you want to use. Click Save Changes to see your site in the new language. You can also choose a different language on a per user basis by visiting that user’s profile screen in the backend of WordPress. Let’s move onto a few plugins you can use to accomplish this task. The first plugin we’ll mention is a simple language switcher that changes the language displayed on the backend of WordPress. It’s called English WordPress Admin. It allows you to switch between two languages, one of which is always US English. The other one, labeled “native,” is the one you set as the Site Language setting in the General Settings section. All you need to do is hover over the menu item the plugin adds to the top bar to switch languages. It’s that simple. It may not help you add new languages to WordPress, but it does make it easy to switch between English and another language. 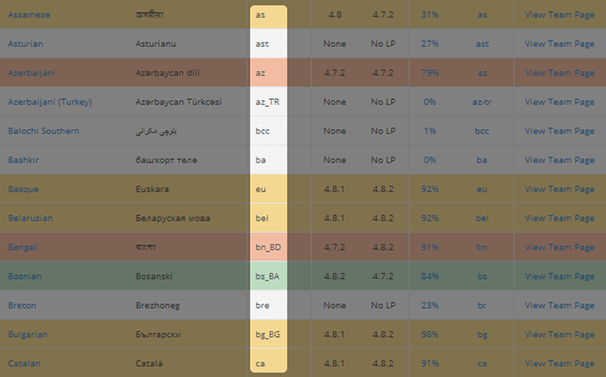 The next plugin we’ll mention is Admin Language Per User. It’s a tad obsolete as WordPress added the Site Language setting to the User Profile screen in WordPress 4.7. However, the developer of this plugin states he’ll maintain support for those who have not yet updated to WordPress 4.7 as well as those who use outdated plugins incompatible with get_user_locale. WordPress is an open-source platform thousands of developers support by releasing plugins and themes for it. Languages are no different. 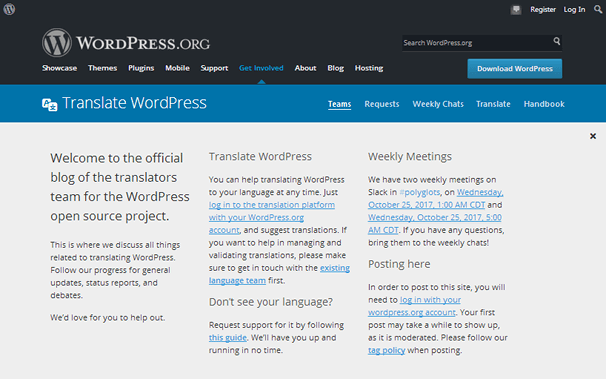 If you visit a section on WordPress.org called Translation Teams, you’ll find dozens of projects for different languages. 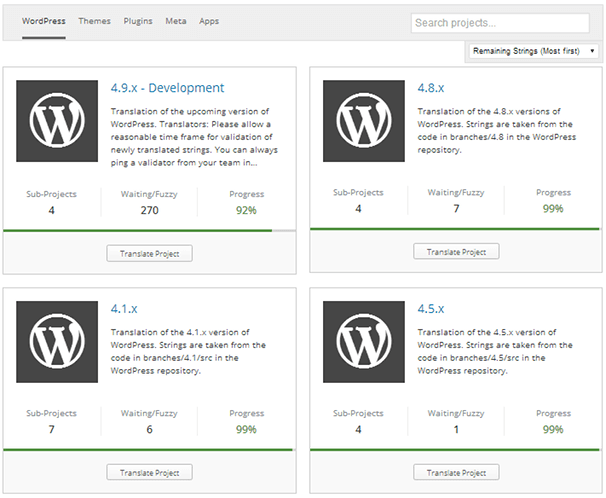 Green: Up to date with the latest version of WordPress. Yellow: Behind minor versions of WordPress. Orange: Behind one major version of WordPress. Red: Behind more than one major version of WordPress. White: Not released, yet, but the translation is in the works. Another thing to note here are the percentages. They indicate how far along the project is. When you’re ready to download the language you want to add to your site, click on its name on the far left side of the table. This opens the language’s official download page on WordPress.org. Click its Download button located on the right-hand side of the page. Open the wp-content folder after that, and open the Languages folder. What you’re looking for are .mo and .po files, which are the file extensions WordPress uses for languages. The next thing you need to do is install the language files by uploading them to your server. The Languages folder does not exist in the main version of WordPress core, so you’ll likely need to create one for your own site. 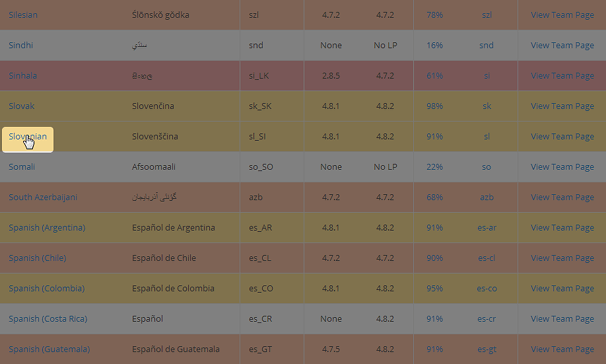 If you’ve ever switched languages using the Site Language setting, one should have been created for you. Open the file manager you use to access your site’s files, whether it’s the one you use from your host’s control panel or an FTP client, such as FileZilla. Open the wp-content folder. 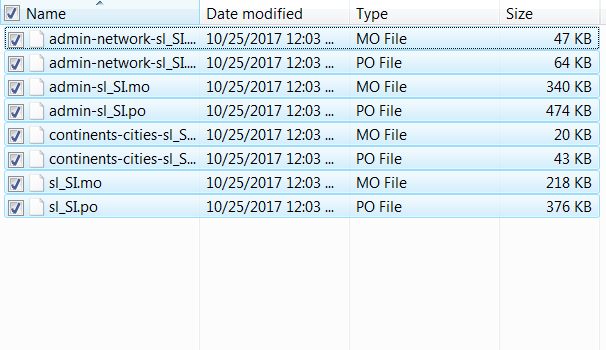 Create a new folder and name it “languages” if one doesn’t exist already. 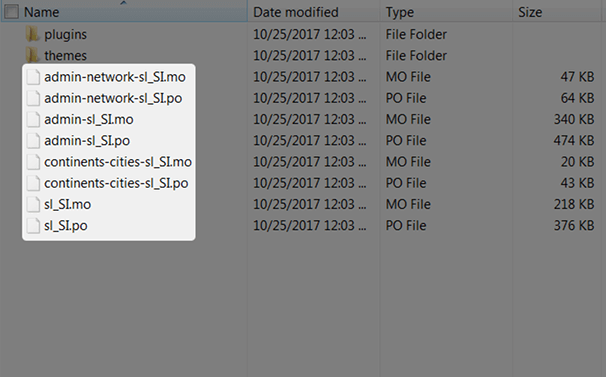 Next, drag the language files (the .mo and .po files) from the translated version of WordPress core you downloaded over to your new Languages folder. That’s it! Your new language should now be installed and activated on your site. Just be sure to change the second part to the WP locale your language uses. Consult the third column on the Translation Teams page if you’re not sure. Let’s talk about the translation teams and how you can get involved before wrapping up. If you want to make suggestions or see how the translations are coming along, head to the translation platform on WordPress.org. You’ll see every project going on. Click the Contribute Translation button associated with the project you want to contribute to add your suggestions (with a logged-in account) or see a breakdown of its progress. 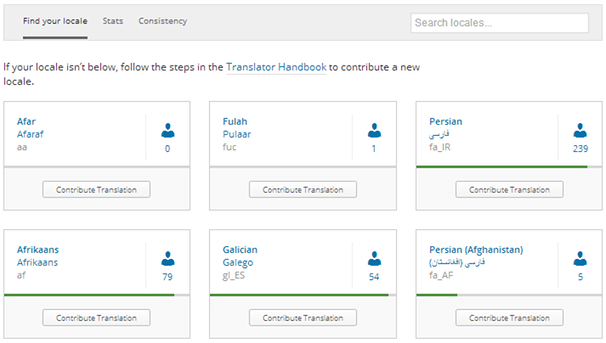 …as well as the plugins, meta content and apps the translation is compatible with. If you want to get more involved by validating and managing translations, visit the Translation Teams page, and click the View Team Page link associated with the project you want to get involved with. You’ll get a breakdown of the team’s managers and contributors as well as how to contact project leaders. If you need more information, go through the Translator’s Handbook, and see if they have what you need. 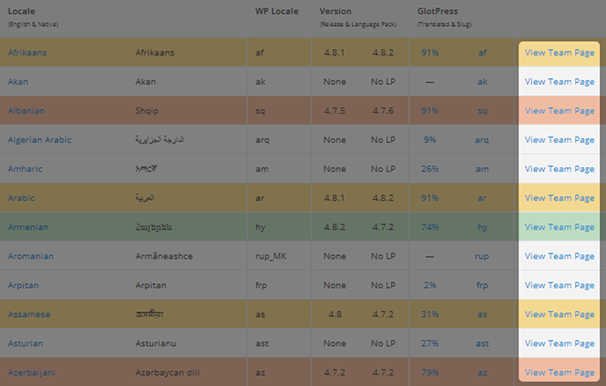 Using WordPress in different languages has never been easier since the release of the Site Language setting in WordPress 4.1. It comes pre-packaged with nearly every language it has a project for, and there are only a small handful you’ll need to install manually. You can even get involved with several translation projects and request an entirely new project for a language that has yet to be translated into WordPress. 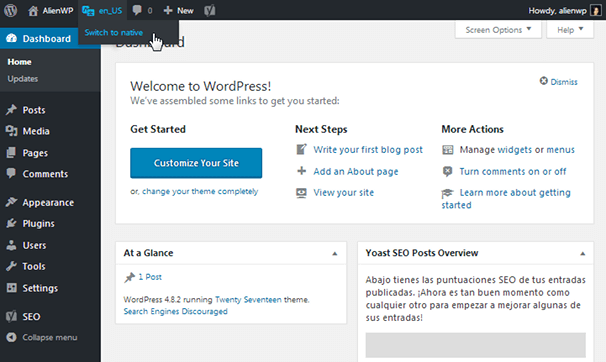 This post was all about using the WordPress admin in different languages. Unfortunately, using WordPress on the frontend, meaning creating a multilingual WordPress site, is a lot more complicated. Be sure to check out the guide on creating multilingual sites we mentioned before if you need help translating your site on the frontend. Lyn Wildwood is a freelance blogger who specializes in writing about such topics as WordPress and online business. We offer a range of WordPress themes along side our blog which aims to help you along the way with WordPress. AlienWP themes and plugins rely on core WordPress functionality to achieve speed, seamless integration and simplicity of use. You won't find bloated options and admin panels here: Only the award-winning, intuitive interface we all know and love. 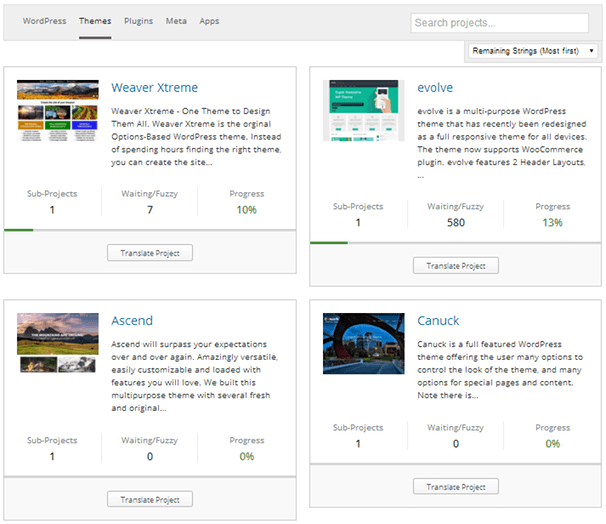 Elementor Plugin Review: How Does it Compare to Other Page Builders?